If you think that a mouse bungee is a joke, then you probably have not experienced the joy of gaming without having to adjust your stuck mouse cable. In worse situations, when your mouse hits an item or your keyboard, it can result in missed shots. Therefore, purchasing a mouse bungee will take your gaming to the next level. The purpose of the bungee is to support the weight that the mouse cable provides making it dangle down. Also, the bungee will remove any drag from your gaming mouse making your movement smooth. Thus, they are especially useful if your mouse has a braided cord because these cords can easily grab surfaces such as mouse mats that result in cable drag. This guide will give you a list of the best mouse bungees to select so that you can avoid sending back products that are made from poor quality. 1. 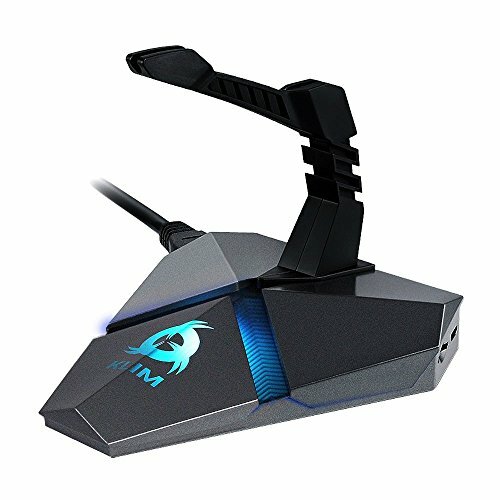 The mouse bungees have the advantage of increasing your accuracy when gaming. This is because they reduce the drag in your mouse cable that in turn gives your mouse a more consistent movement. 2. You will also experience a better feel with the device because you will get the same sensation that you get when using a wireless mouse without the excess weight and charging requirements. 3. Some of the bungee products have incorporated built-in USD hubs that you can connect to extra peripherals. 4. Also, the mouse bungee will make your working area look more organized. This mouse bungee has the style of a tripod. It is comprised of a mouse wire option made for managing the mouse. This option allows you to move your mouse with zero drag as you game. 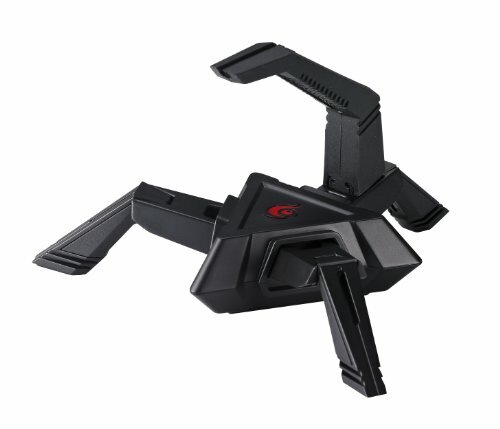 Also, the mouse is designed to look like an alien space ship, a look that is pleasing for most gamers. The mouse bungee has three legs and is made from very durable plastic. The bases of the legs have non-slip pads. Additionally, most of the weight of the mouse bungee has been placed in the middle to ensure that it remains stable. The wire is held in place by an arm that is flexible and made from silicon. Thus, regardless of how often you use the arm, it will remain secure. This is achieved through the strategic placement of vents in the arm. These vents allow the arm to move backward, forward, left, and right depending on your need. Besides, this part of the product has been designed in a manner that makes it compatible with a variety of mouse wires. Hence, if you choose to make an upgrade, you will not experience problems. Another advantage of using this product is that it raises more compared to other devices. Therefore, you will get to enjoy a visual experience that is unique. This mouse bungee will pair well with your extravagant gaming rig. This razer mouse bungee is an upgrade of the original razer model. Thus, it is made up of features that better work for any gamer. For instance, it has a cord control that is free from any drag and one that is up to 3.2 mm. Also, the arm of the product has a spring that allows natural movement and zero resistance from the mouse. Additionally, the spring arm has been made form a material that will not degrade over time or rust. On the other hand, the feet are made with an anti-slip material that keeps the product in place. Also, the base of the product has added weight to increase its stability while you play. Another advantage of using the razer bungee is that it uses both the braided and the non-braided types of cords. It also works well with a variety of mice. The arm has a spring design that makes it difficult for the bungee to move or flip as you play. 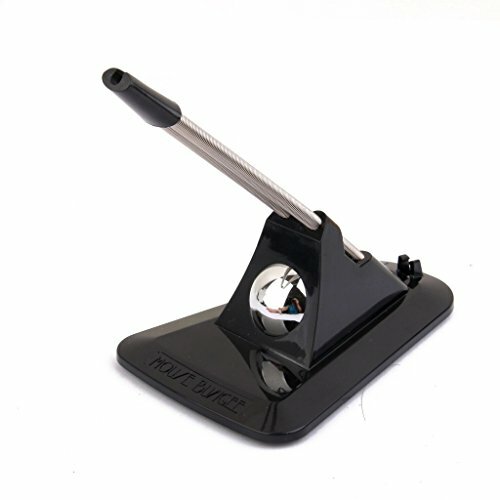 The neutral black color of the product will also fit with any desk design, thus making it perfect for use on any desk. Additionally, the product is absent of an adhesive bottom that makes it possible to move the product from one office to the other. If what you want is to have a high-level experience of gaming done, the Thermaltake Galeru mouse bungee is the option for you. This mouse bungee is stable, attractive, and it can work with a mouse cable that is thick or thin. Hence, when you feel the need to upgrade you can keep your bungee. Also, cleaning the mouse bungee is easy since the head is removable. The detachable feature of the head is due to its magnetic nature. Additionally, the entire structure of the Thermaltake is detachable; thus, you can disassemble the product to make the movement more manageable. To ensure that the mouse bungee has maximum stability, the product is comprised of three points of contact. Besides, each one of its foot has a base with a non-slip pad to help keep the bungee in place, and the rear foot is designed to be large so that it can enhance stability. To ensure that the arm has movement when you are playing, it is rubberized. The Thermaltake Galeru weighs a total of one pound. It is also a small sized product that will not take up too much space on your desk, and one that will make it is easy for you to manage. This is a banker mouse bungee that will make your cords work quickly while you game. Therefore, you will not have to hassle to manage your cord. Additionally, the base of the product is ultra-compact while the overall device is made with a lightweight. 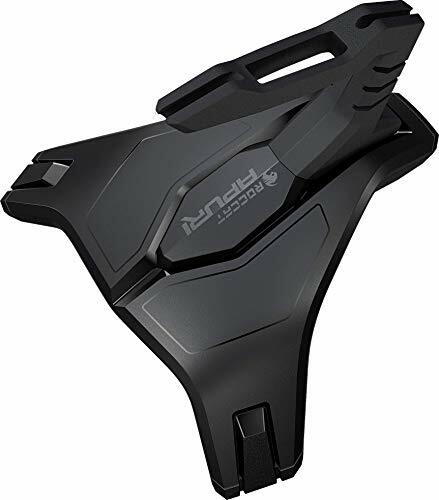 The arm of the mouse bungee is made using durable rubber. Also, the gaming bunker is kept in place using a patented vacuum design. This bunker can also fit both thin and thick cables. Also, the patented design ensures that the device remains stable and secured when you place it on a wooden surface. 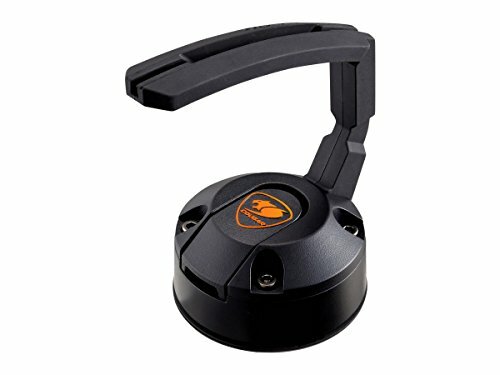 The defining feature of the Cougar Bunker mouse bungee is its design that looks like a suction cup. This design makes it hard for the product to move around the desk because it has exceptional strength. Therefore, you will not have any need to adjust the device once you start using. Besides, the arm of the Cougar Bunker has a perfect design. The arm is strong yet flexible making it easy to customize your gaming setup. Therefore this is a product that is both effective and smart. This mouse bungee has a retro design. It is made with a triangular design that is very distinct. The design allows the mouse bungee to have a broad base that gives the product a lot of support and traction. Thus, the mouse bungee will not move around as you play your game. It is also very durable and weightless. Additionally, the base of the product has been coated with an anti-slip material. This ensures that the Casethrone Bungee has significant amounts of functionality. Therefore, if you play games with numerous amounts of mouse action, this is the best product for you. Additionally, the top of the Casethrone Bungee has been made using metal coils that adapt to the movement of your wire. Thus, it is a flexible product. Also, the top of the product has a red lid that allows the wires to run through. This design provides that the mouse cables, whether braided or not, are held securely and tightly. Another feature of the cable holder is that it is removable. Therefore, it is easy to clean. 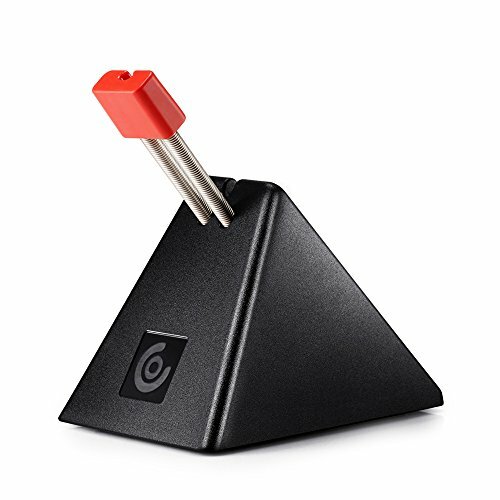 On the other hand, the back of the triangle has been designed in a manner that allows it to clamp on the cable giving it multiple points of contact. Thus, your mouse experience will be secure and supportive. This product is ideal for any gamer that wants a bungee on a budget. It is made with a design that is simple but functional. The bungee is also made using metal and plastic. You can also adjust it to the angle that is specific to your preference because it uses an adjustable wire clip. In addition, any mouse with a cord that you use will fit inside this clip easily. Additionally, moving the mouse around will not cause any problems. Three slots are available for managing the cord. However, only the middle slot is fit for thicker cables. Therefore, if you want a mouse bungee for your office or one that you will be using lightly, this is the option for you. This is because it is lighter than other bungees. Hence, it moves around more than the other products even though you can play. Also, if you use it aggressively, it has a reputation for breaking. Thus, while this model works well in gaming and is budget friendly, it is not the best in terms of quality. This is the mouse bungee to use if you want to make sure that you do not experience any problems with your cable. The uniqueness of this product stems from the fact that it is made of metal. Thus, the bronze like the structure of the bungee will make it stand out on your desk. Additionally, the product will ensure that your cable remains nicely elevated. 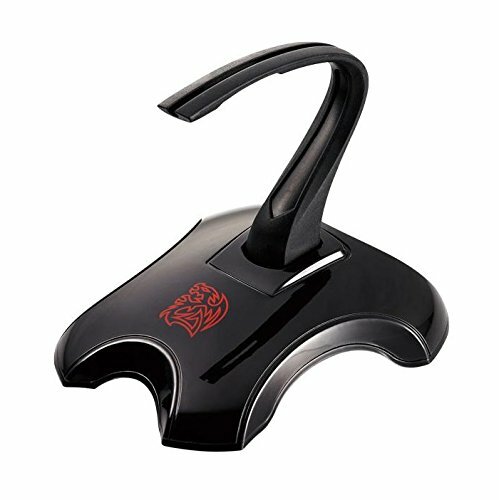 Its weight is about six ounces making it a good anchor for ensuring that your mouse stays in place. Also, it has a flexible arm for holding the cable, and it will keep your mouse where you want. The Rich Boxer Mouse Bungee also comes in a variety of three colors that you can select. These colors include gold, rose gold, and black. Regardless of the color that you choose, it will still make a statement on your desk. Also, the product has incorporated a matte option that will be perfect for you if you do not prefer shiny peripherals on your desk. The design of the product at the base also has a metallic orb that adds accent to the overall look of the product. If you love scorpions, this scorpion-themed product will melt your heart. The design of the bungee has been made such that it rests on feet that have a scorpion style. These feet also have non-slip pads. 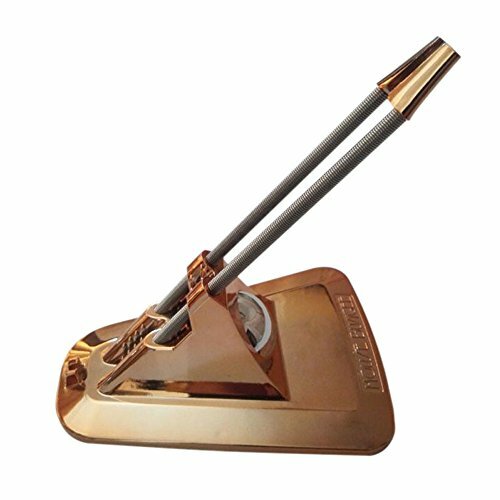 Moreover, this product has an iron core that is very dense making it easy to maintain on one position as you play. Also, the weight of the product is close to one pound meaning it can be used free from cables because of its convenience. The tail of the Cooler Master Skorpion will also make sure that your cable is adequately managed. The tail is made from silicone making it flexible to move in any direction without any hindrances. You can use both thin and thick wires with this mouse bungee because the wire catchers are easily adaptive. This also means that you can use a cable mouse that is braided with the product. Another benefit of using the device is its portability. It is made up of mobile features that can allow you to disassemble the product when you want to move. Also, once disassembled, it becomes easy to store without worrying about damage. If you are looking for versatility in your mouse bungee, the KLIM Cord is the perfect product for you. This is because it is made with a few extra whistles and bells. Apart from managing your cables, the product will also allow you to pack three USBs that you can use to connect to additional peripherals or transfer data. Also, the USB on the KLIM are USB 3.0. This means that you can charge any of your devices faster with this product. You can also transfer data at a speed of six gigabytes each second. KLIM also offers an SD card reader and a micro USB slot that adds to its versatility. However, the KLIM bungee is relatively heavy with a weight of slightly over eight ounces. The bottom surface of the product has a slip resistance that prevents it from moving when you play. Its arm is made of rubber and rigid construction. Therefore, it will only move if the mouse wire moves as well. Another feature that makes the KLIM Mouse Bungee a perfect choice for your desk is the incorporation of LED lights that are used to illuminate the product. Thus, you will get a sense of enhanced gaming experience with this device. This bungee is very functional because it has many components that are good for any gamer. It is also built in an aggressive design style. First, this feature has a USB hub. You can plug in a total of four peripherals that you can use to transfer data from your primary drive. You can also use a USB headphone with this product. 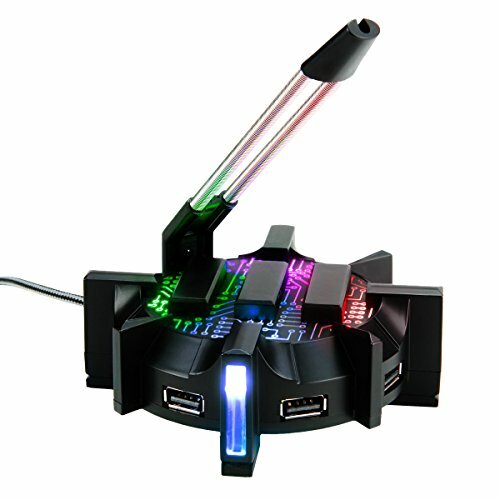 Second, the Enhance LED Bungee is made up of three feet filled with the appropriate amount of traction that will not let the mouse wire drag around your desk. This is also aided by the base of the product that is made from non-slip material. Thus, the bungee is stable with an added bit of weight. When considering the aesthetics of the product, there are also some added benefits to consider. 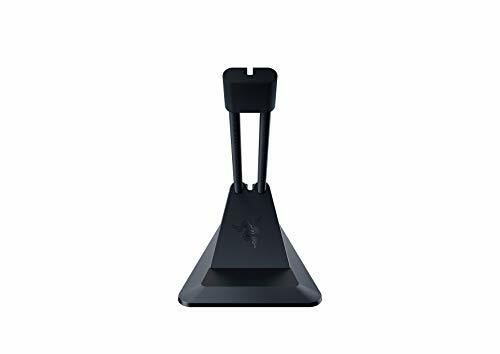 For starters, its entire design is a beauty, with a shape that resembles a scorpion that you can use to intimidate other gamers that are in your rig. Also, the product is accentuated with LED lights that illuminate the body to give it an appealing look. These lights are made in three colors that include green, blue, and red.